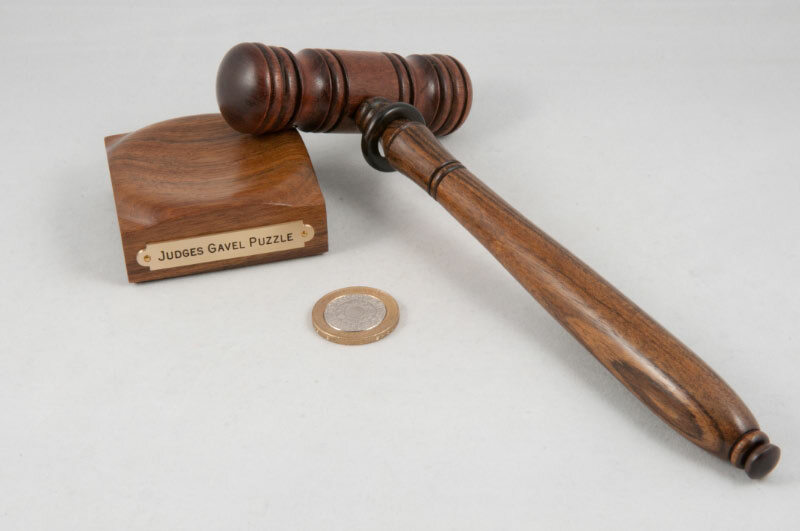 I first noticed Mike Toulouzas’ Judge’s Gavel in the entries for last year’s Nob Yoshigahara Puzzle Design Competition on John Rausch’s web site – and soon after the end of IPP31 spotted that it had been awarded a Jury First Prize Award … and then a couple of weeks later I really enjoyed reading Brian Pletcher’s descriptions of his experiences with the various competition entries – and the one thing that made me smile was his references to the loud “THWACK!” whenever anyone was working on Mike’s Gavel. Toward the end of last year, I’d been swapping emails with Mike about another of his puzzles and I mentioned in passing that if he ever made another run of Gavels, I’d love a copy, and then promptly forgot about that for a couple of months – during which time I found myself playing with a copy at Peter Hajek’s place and thinking to myself that it really was a rather cute puzzle … so when Mike got back in touch a few months later and said he had some available if I was still interested … it didn’t take long to Pay(pal) the man and take receipt of a nicely packaged block and hammer! The new run is, I suspect, a little smaller than the earlier run (and I’m going on my recollection of the size of the Gavel on Peter’s bookshelf back in December – so I may well have that wrong!) and has had a neat brass plate added to the block that proclaims “Judges Gavel Puzzle”. 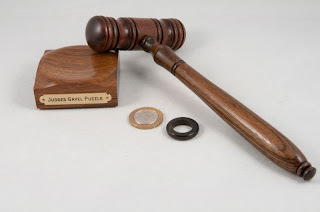 The block is made of Lignum Vitae – that super dense wood that actually sinks in water, and the Gavel is made of a combination of Mahogany and Mexican Ebony. The shaft of the gavel has a trapped ring spinning loosely around it and your goal is to free the ring … the only strange thing you’ll notice more or less straight away is a small hole on one side of the head of the actual gavel. 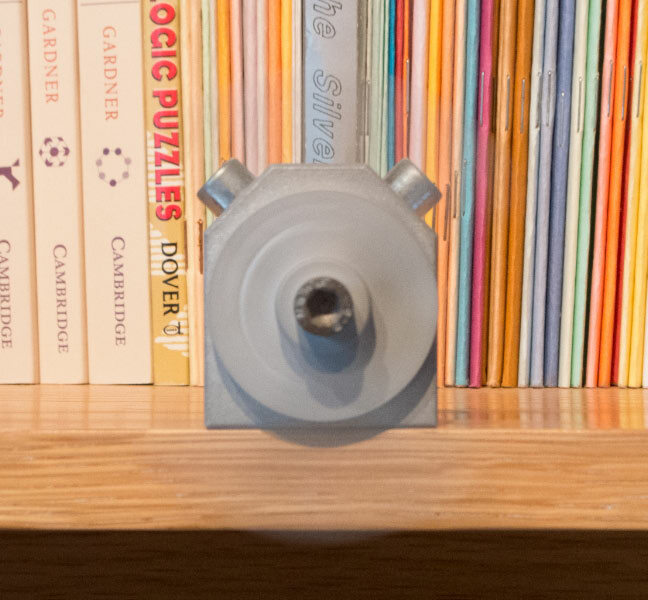 You’ll probably be tempted to try unscrewing the handle from the head (yip it spins pretty freely – although sometimes it seems even freer!) 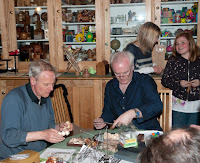 or even unscrewing parts of the head itself – and they won’t get you far. At some point your inner child will get the better of you and you’ll have a bit of a “THWACK!” and you’ll find that quite satisfying and you’ll probably have a few more goes before you get to wondering if all that thwhacking might actually even be useful – result! 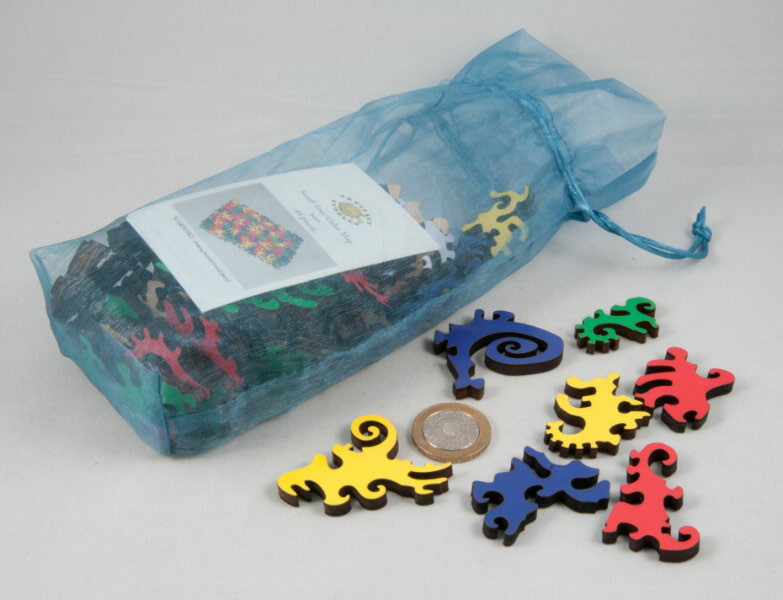 – A puzzle that encourages you to play like a child! Brian’s original description got it spot on – what makes the puzzle great is that it’s very gavel-ness is central to the solution of the puzzle – and that’s very satisfying. Mike’s lathe-work is expert. 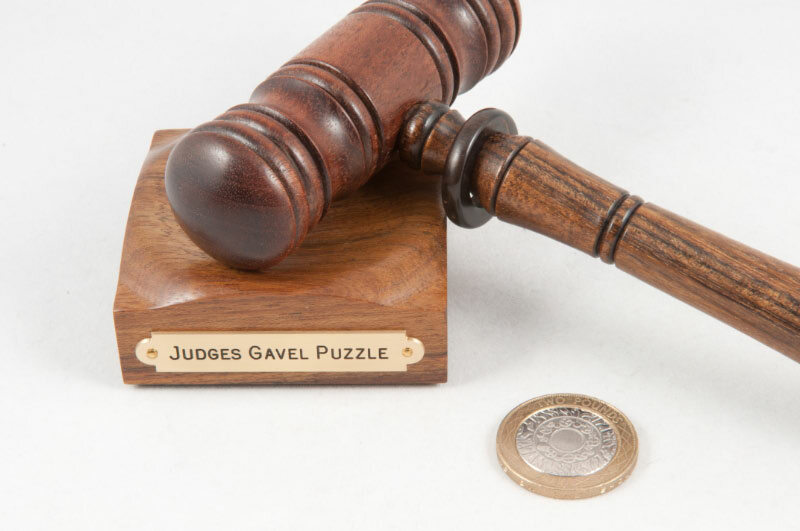 The gavel absolutely looks the part and you’ll have no qualms about giving it a decent tonk on the supplied block – if it weren’t a puzzle, it would still look great – knowing it’s an award-winning puzzle as well makes it something really special. Thanks Mike – it’s brilliant! 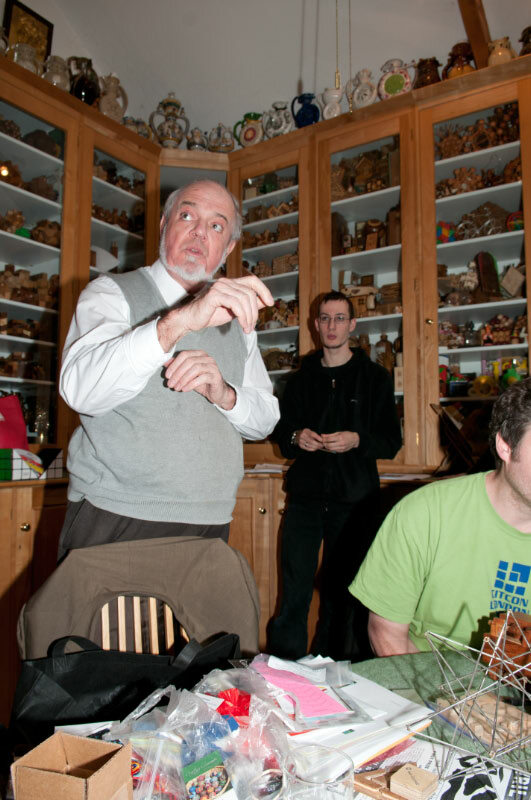 Back in December at Peter Hajek’s EPP (don’t worry, I think I’m running out of excuses for continually referring back to this one!) 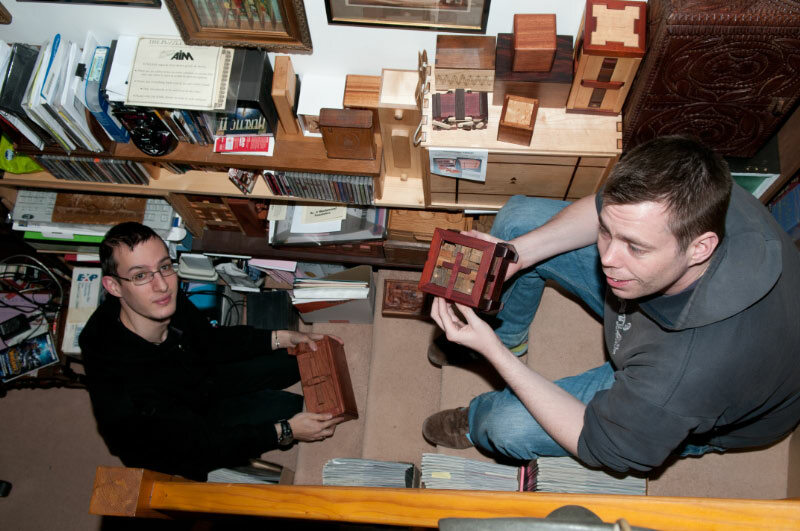 a couple of the guys there had brought along some spare puzzles they were interested in trading or bartering – and as I’m rather new to this whole puzzle-collecting thing, I don’t really have any puzzles I want to get rid of yet, let alone have any spares or duplicates, so when I spotted something interesting, I was forced to resort to the puzzlers' lowest common denominator: cash. 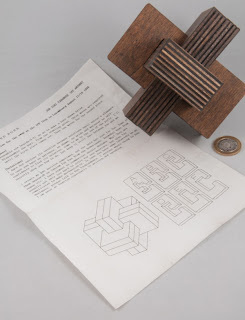 I did spot a couple of interesting puzzles in one of the crates and managed to strike a deal with their former owner, and as a result I managed to add a couple of interesting (even if only to me!) 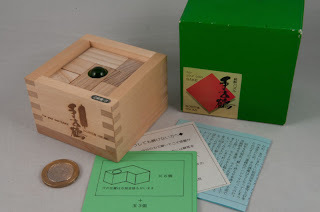 Japanese puzzles to my little hoard. The second item I spotted was a Nob Yoshigahara design called For your own sake made by Hikimi. I recognised the puzzle from a puzzle auction listing and thought it looked quite cute. 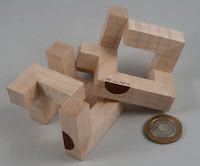 Nob designed a set of puzzles based around the traditional wooden sake cup (masu) and used them to great effect as the basis for several packing puzzles and even a hidden maze or two. 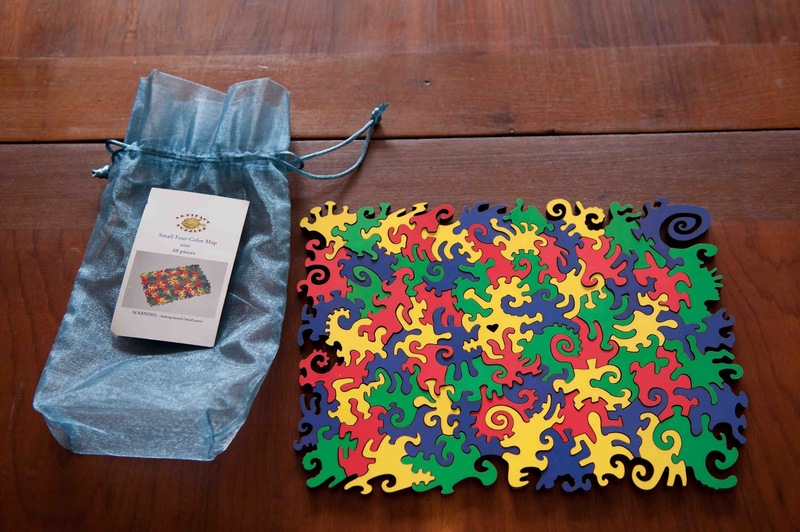 For your own sake is a packing puzzle with a bit of a twist. You have 6 L-shaped pieces to place into the masu ... along with three marbles – two yellow and one green if you’re interested. 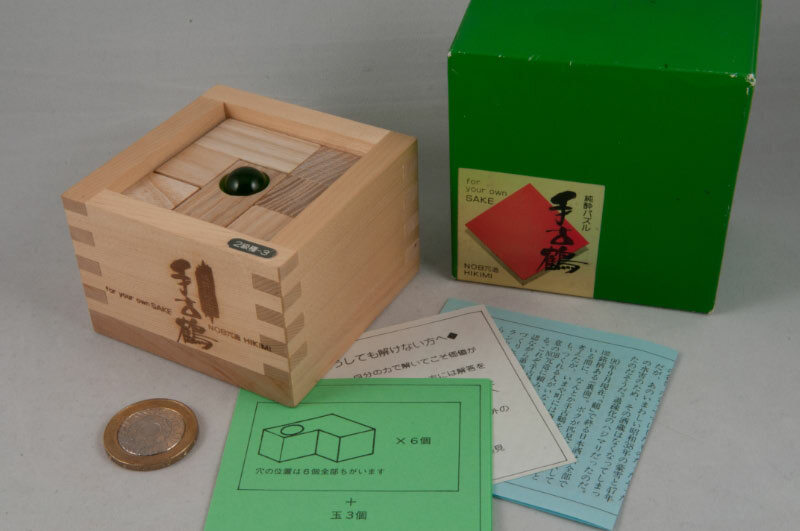 When you first open the box, the green marble is sitting proud half out of a piece in the centre of the box and the two yellow marbles are nowhere to be seen until you tip the pieces out. The L-shaped pieces have a series of half-spheres cut into them, so that if you place two of these holes next to one another, you can hide a marble in the hole ... and the object of the puzzle is to pack all the pieces in the masu such that all marbles are hidden. OK – so we have 6 L-shaped pieces to pack into two 3*3 layers – and we know that all of the holes need to be facing another hole (there aren’t any spare holes – that would just be mean ... evil laugh heard in puzzle design shop in the distance...) and moreover they all need to be internal – which should narrow things down quite a lot ... should be simple, except master Yoshigahara has gone and placed the holes in particular spots – probably not intentionally to make it hard to solve, that’s probably just a fortuitous unintended consequence! In fairness, it’s not horribly difficult – even I managed to find a solution without the help of my usual tool of choice – although I did use it to confirm that there are 8 solutions available. Cute little puzzle that really stands out with the green marble perched in the centre of the box inviting you to pack it away properly. According to Wikipedia, the less formal version of the Four Colour Theorem states that “given any separation of a plane into contiguous regions, ... no more than four colours are required to colour the regions of the map so that no two adjacent regions have the same colour”. Which is fine if you’re a mathematician – I think it means that you can colour in any flat map (drawn anyhow you please) such that each enclosed area is a different colour to all of its neighbours, using only four colours … and before you hit the comment button, I know that’s not nearly rigorous enough for a mathematician, but I suspect that it works just fine for the other 99.9% of us. That particular little puzzle had fascinated mathematicians for ages and was eventually proved by Appel and Haken in 1976 using a combination of brute force computing and good old-fashioned analysis on paper … which is an awful lot of background, but as I’m not usually a big fan of jigsaw puzzles, I thought it was important, if only to convince myself that this wasn’t just any jigsaw puzzle – it was really a demonstration of a mathematical theorem – and that makes it OK! 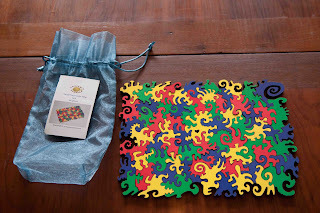 I first stumbled across this rather interesting jigsaw puzzle when I read Brian’s blog about the puzzle over here – the idea of a jigsaw puzzle with no picture on the face of it, where no colours ever join up, and pieces that are just plain whacky, was more than a bit appealing. 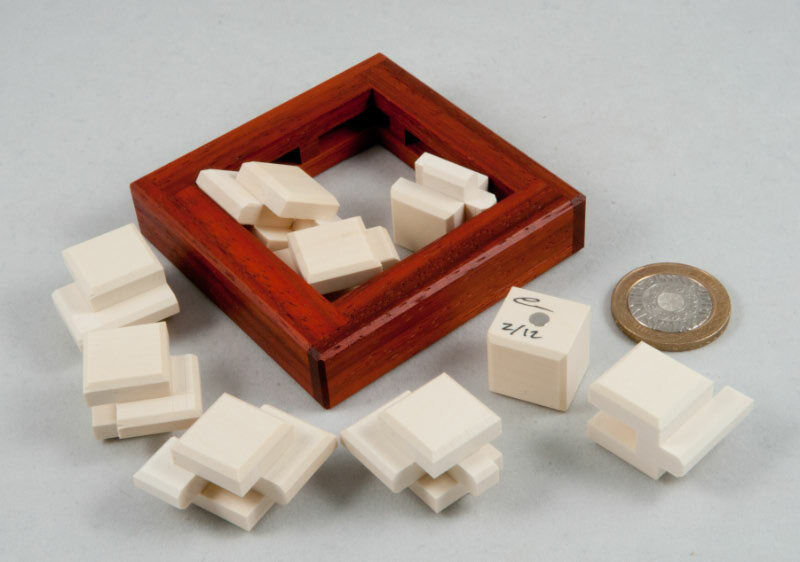 I duly followed the link across to Artifact Puzzles and was more than a bit gutted to find a wonderful selection of interesting jigsaws (yes – they looked intriguing enough to interest the non-jigsaw-lover!) being offered by a company that would only deliver to the USA … and I’m on the other side of the pond. Dagnabbit! It seems that this same experience had struck one or two other folks “over here” and a few months later puzzling-buddy Louis asked if anyone was interested in one of these puzzles after he’d convinced one of our American connections (The Juggler!) to play middleman and send them across the ocean – in a mate’s luggage as it turned out … and in the end about six of us were able to get our grubby paws on a copy of this great little puzzle, and then Louis wouldn’t even let me pay for mine on the grounds that I was providing board and lodging for his last trip to MPP5 – thanks Louis! It comes in a drawstring bag and has a small picture of the assembled puzzle stashed with the pieces – don’t pay too much attention to that and you’ll enjoy the puzzle more – trust me. A quick look at any of the pictures will show you that the pieces are different – very different! They’re literally designed to stretch the four colour theorem in lots of ways and as a result you have some unusual joints – including a few places where you’ll find more pieces coming together than you’d originally expected – and yet you’ll never find adjacent pieces with the same colour … and yes that’s useful, especially once you get going. Being the horribly organised type, I sorted the pieces by colour and then set about trying to find obvious joins. (In fairness, that was the only way to start it since there aren’t any straight edges or pictures to build up!) Once you have a couple of pieces together, you can narrow down the piles that need to be searched for the next pieces to add on by eliminating touching colours – and that’s generally a good strategy, but as I said, every now and then the shapes of the pieces throws you a curve-ball and the single piece you’re looking for turns out to be a combination of two or more pieces. It took me the best part of an hour and a half (and a cup of coffee) to complete this little puzzle – and it only has 68 pieces! And I really enjoyed it, even though it’s “just a jigsaw puzzle”. In fact I’d probably go so far as to say that if you were only going to admit a single jigsaw puzzle to your collection of mechanical puzzles, this would be a pretty good candidate. James Dalgety invited me along to one of his customary Mini Puzzle Parties over the past Easter weekend, and as luck would have it, we didn’t have a house full of guests so I was allowed to make the trip down to deepest darkest Devon. I arrived to find Lily and Percy (the pups) entertaining Lindsey outdoors with one of their tennis balls. I dropped off some of Gill’s puzzle cake in the kitchen on my way through to the puzzle suite (the puzzle is to work out what the flavour in the cake is ... and it took the ladies quite a while, several samples and even some Googling to eventually find the right answer!) 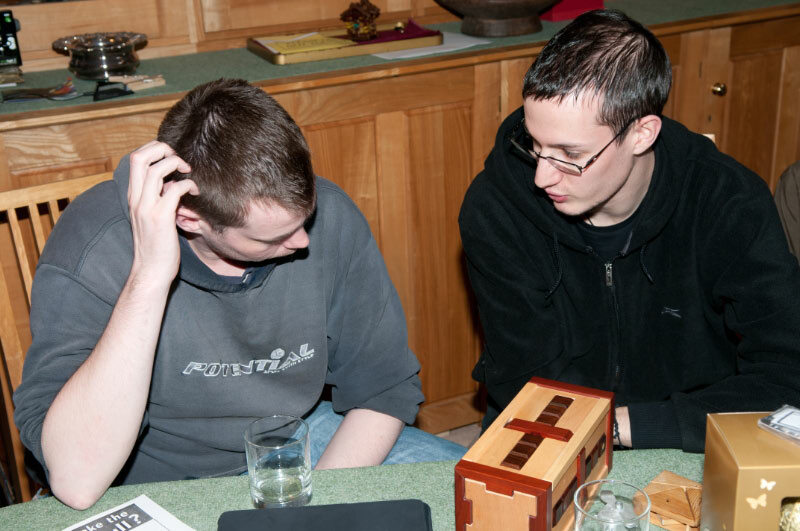 where I found Oli and James already puzzling away. 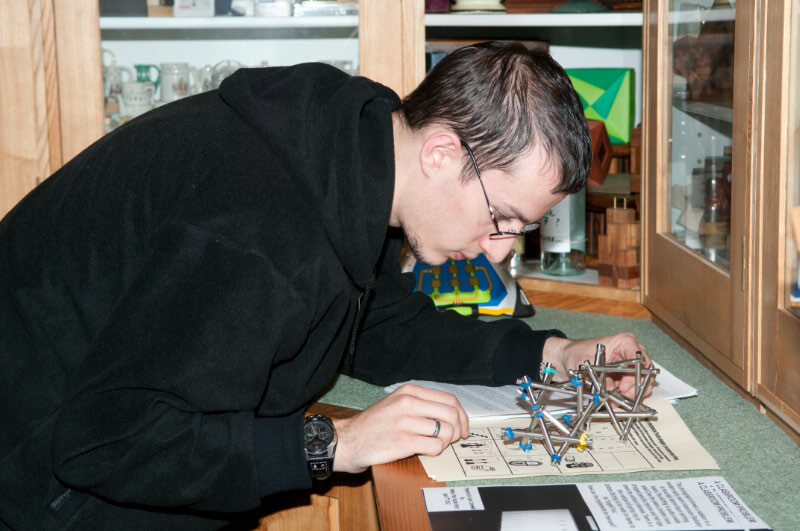 I gave my homework back to James (some unusual burrs needed assembling – and I managed all bar one of them ... and I still reckon there are too many pieces there, although I wasn’t convinced when James suggested it was probably a couple of puzzles!) and unpacked my offerings for the day. 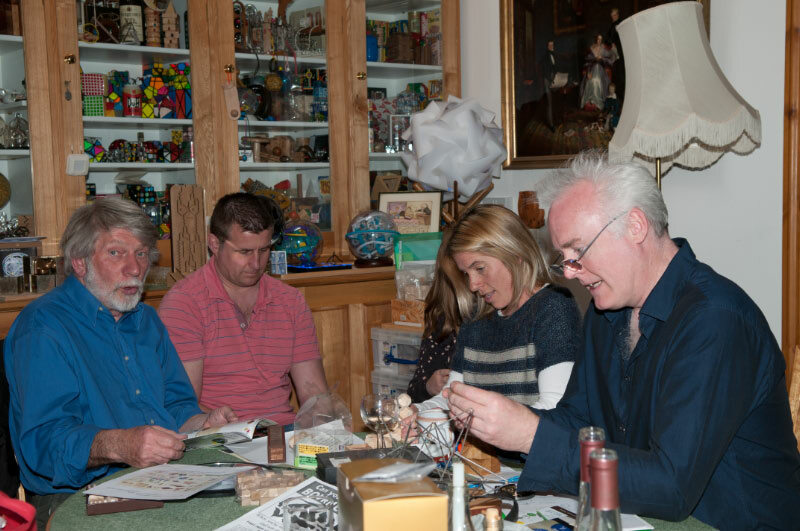 Most folks had been along to James’ place a few times already and pretty much settled in with a cup of tea or coffee and picked up a puzzle to start playing with. 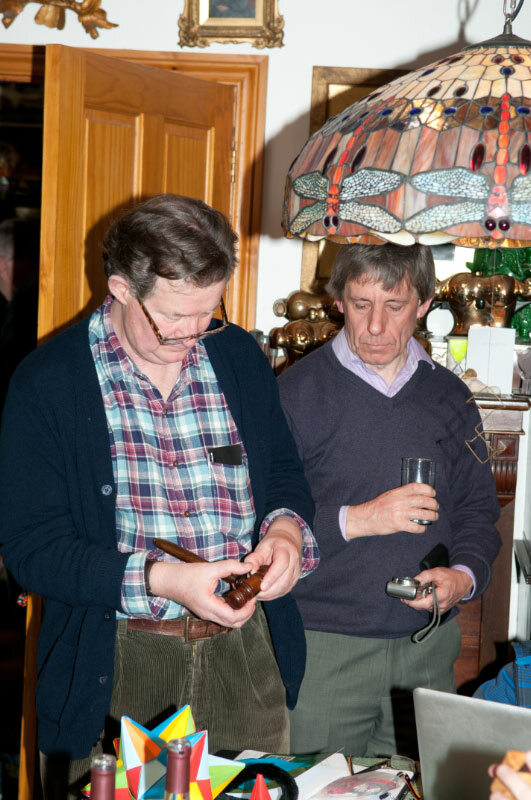 James had asked me to bring along my Judges Gavel and a few folks had a bash at it – literally! Although some were a bit hesitant and needed some encouragement and I needed to point out that it was a gavel after all, and using it as such isn’t likely to do any harm – every now and then you’d hear a familiar “THWACK!” and you’d know that someone was having a go on it – and every time I heard that I was reminded of Brian Pletcher’s description of the competition puzzle room at IPP31 where the usual silence would be shattered every now and then as someone picked up Mike’s gavel ... it always puts a smile on my face. I’d also taken one of Jane Kostick’s wooden & magnetic sculptures along and a couple of folks experimented with taking them apart and reassembling them, although I found it hard to convince people that it really was easy to reassemble – I guess it just looks a bit too much like one of Stewart Coffin’s diabolical puzzles for them to believe that it’s actually quite simple to put back together and even fun to play with. I managed to spend some time with John Lavery – chief organiser of the monthly Camden Puzzle meetings - and he’d brought along a book containing some examples of brother Angus’ incredible card-folding ... I’d only ever seen a couple of pictures of impossible playing card folding on the web, but seeing Angus’ designs close-up and personal was pretty mind-blowing – they ranged from designs that looked fairly straight-forward through to one that was literally staggering – five interlinked Olympic rings on a standard playing card – when John showed us that one he smiled and said Angus says this one takes quite a while and doesn’t always work out properly on the first attempt – no kidding! 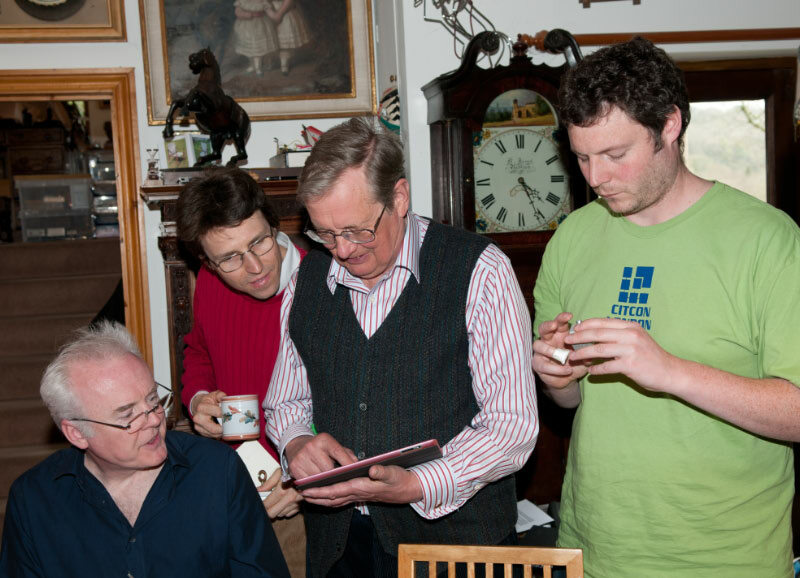 He also had a couple of pictures on his iPad of linked rolls of sticky tape – they look like they’re fresh off the shelf at WH Smith, except they’re inter-linked ... there’s just something wrong with seeing that, but then the same can be said of Angus’ card-folding – quite simply it all defies belief! 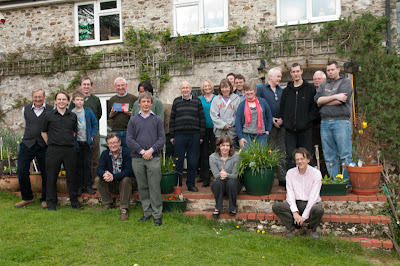 During the afternoon Tim Rowett gave us a short talk on his recent trip to Gathering for Gardner in Atlanta and shared some of the little gems he’d picked up there, before the Simons (Bexfield and Nightingale) chipped in with more stories and recollections of what sounded like a fabulous time – which may have included some alcohol according to one or two of the allegations being bandied about. Over the course of the day several folks had a bash at one of Geoff Wyvill’s Nova Plexus that James had left on the table hoping it would be assembled – many tried only to see it collapse in a jangly heap of steel rods to the collective groans of all who’d been looking on willing them to succeed – until Oli eventually had a go at it and succeeded where no-one else had managed – and there was much rejoicing and even some posing for a victory photograph! I’d spent quite a while trying to put a little Japanese burr house structure back together and managed to come reasonably close before I put it to one side with several strategically placed rubber bands holding things together – only to realise on my way home that evening that my approach was flawed and it couldn’t work the way I was trying it and that transposing two pieces would literally have had it together in a matter of minutes ... hopefully James’ll have better luck at it than I did. Several Roger’s did the rounds and proved extremely popular with all comers – with everyone seeming to enjoy working out Schleussel (the lock) and then spending ages analysing it and trying to guess exactly what the innards looked like. Oli had a storming day on the Rogers, solving both Eis and Geburt in quick succession before taking over the Stickman #4 Box that I’d totally failed to open – and between him and James they made short-shrift of it. 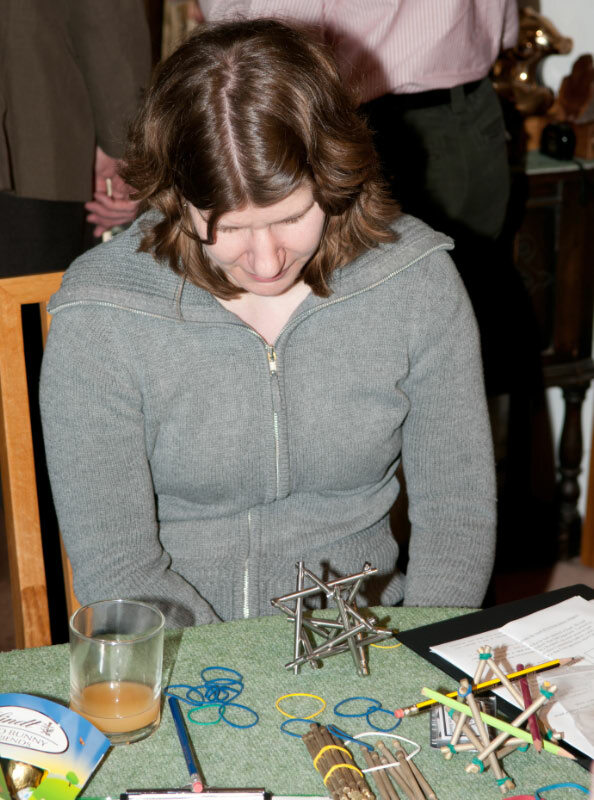 I met few more relatively local puzzlers (Yeah, I travelled down to Devon to meet some guys who live less than an hour from me :-) ) who’ll definitely find themselves being invited along to our little puzzle parties in the Midlands in future – it was nice to meet yet more legendary puzzle designers and see them playing with puzzles they haven’t seen before and seeing the same glint in their eyes when they have that little A-Ha! moment. 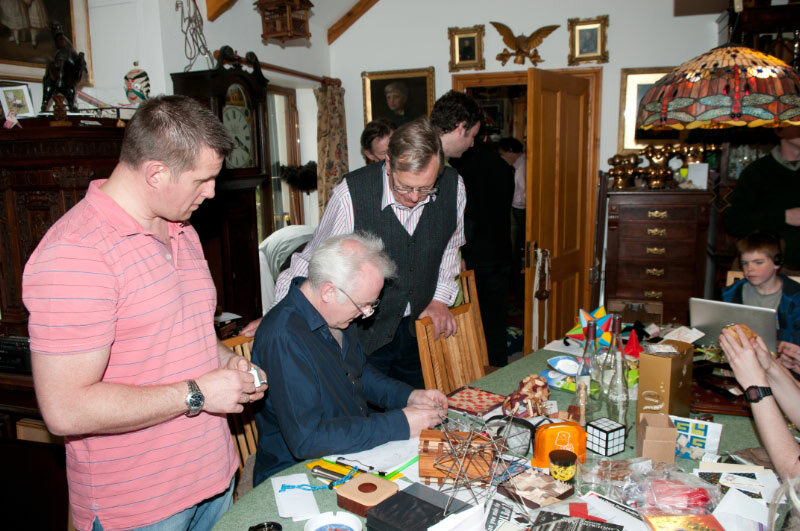 The two and a half hour drive home flew by as I recalled little snatches of conversations and jokes about puzzles while I listened to Robert Miles and U2 – another absolutely wonderful day, thanks to James and Lindsey’s legendary hospitality and generosity. 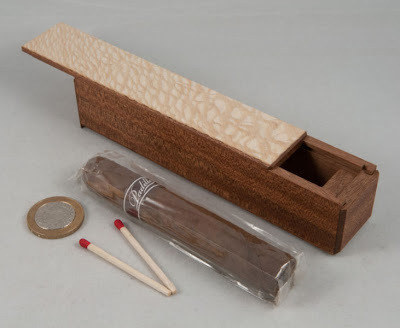 The second in Eric Fuller’s series of cigar boxes had me stumped for quite a while. There are a couple of relatively obvious things to do to it at the start, and I did them all, but then I found myself at a bit of a loss – the lid would open an inch or two, showing you that there was a cigar in there, along with a couple of matches that could be tipped out, but try as I might I couldn’t find anything else to do … so it was placed on the “To be solved, damn-it!”-shelf on the desk and every now and then I’d take it down and try something slightly different in the hope of stumbling onto something useful (OK, quite often I actually tried exactly the same things hoping for a different outcome … and I know that some clever bloke had some opinions about the wisdom of that approach!) . 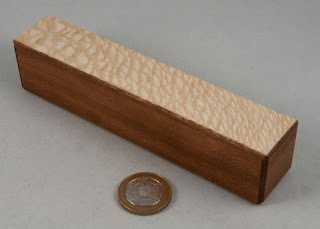 OK, the box is made of Sapele and is named after the “one of the friendly part-timers behind the bar” according to Eric’s description – mine has a bleached Lacewood veneer on the top and bottom. It’s supposed to be a step up from Chris and I can certainly vouch for that! 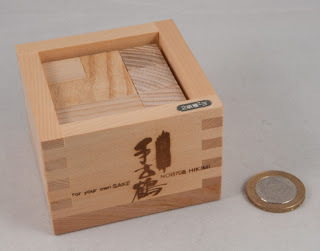 I’d read Brian’s blog about the box and took his warnings about not shaking and bashing the box for fear of finding an ‘alternative’ method of opening it …although I did try doing exactly that, just a little, anyway – and had no success at all. 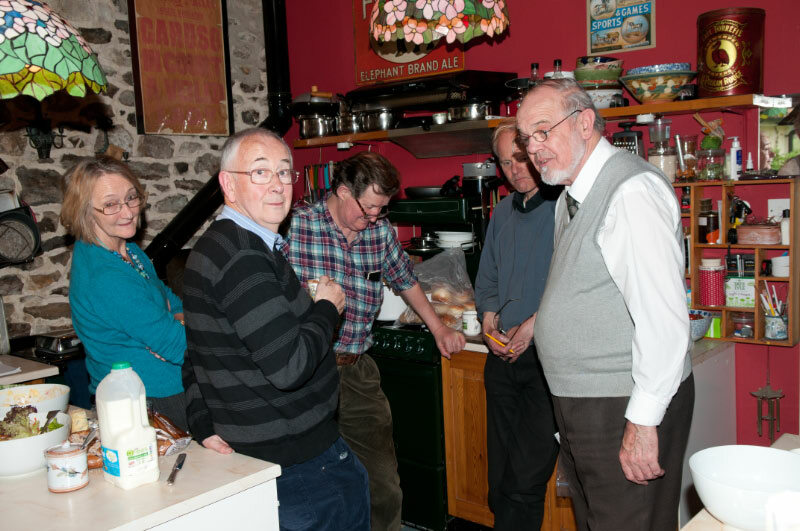 So I did the obvious thing, and left it out for Louis on his last visit – he’d solved it by the time I got up the next morning – how’s that for service! 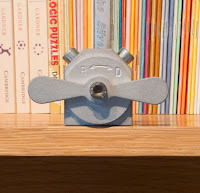 All was clear – and I’d been totally fooled – the mechanism is neatly hidden and had eluded me for weeks … in my defence, the first few moves send you off in entirely the wrong direction. I like the fact that once opened, you can actually remove a few of the panels entirely, and see just how Eric has got some of them to behave the way they do – he is quite clever with those little things! 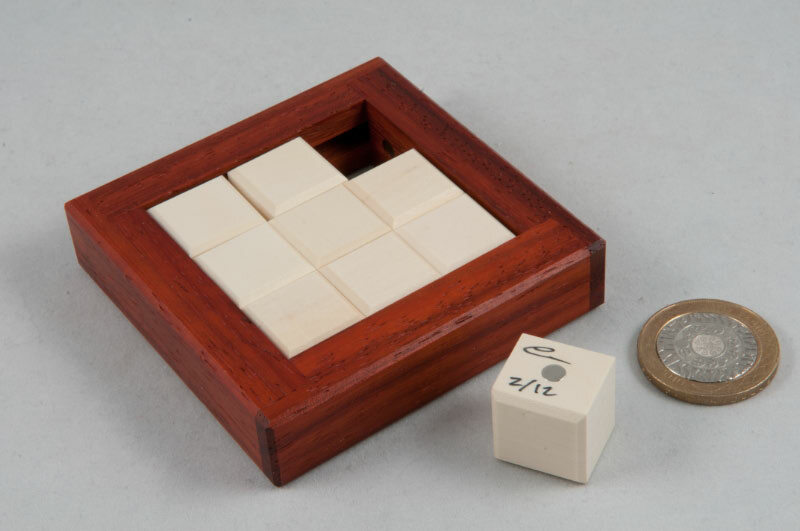 Tom Jolly’s Square Dance is an intriguing little puzzle that sort of looks like a little 3*3 sliding tile puzzle – at least inasmuch as there appear to be 9 square tiles in a frame and one of them can be popped out to enable you to move the remaining tiles around, a bit, except there are no markings or pictures on the pieces. 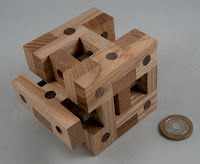 Now I’m not sure if that should make it a really easy puzzle (after all, any assembly must be right!) or a really difficult one (what if there are other complications?). Popping out the first corner square (it’s kept neatly in place with a pair of magnets) gives you your first hint at what lies ahead – there is a track around the inside of the frame, and on some of the pieces, and each piece has a series of tabs sticking out to engage the other pieces and the frame … which is fine, except that the Padauk frame then has a series of strategically placed blocks stopping you from moving some of the bits where you want to, and a little experimenting soon shows you just how unexpected some of those tabs really are. 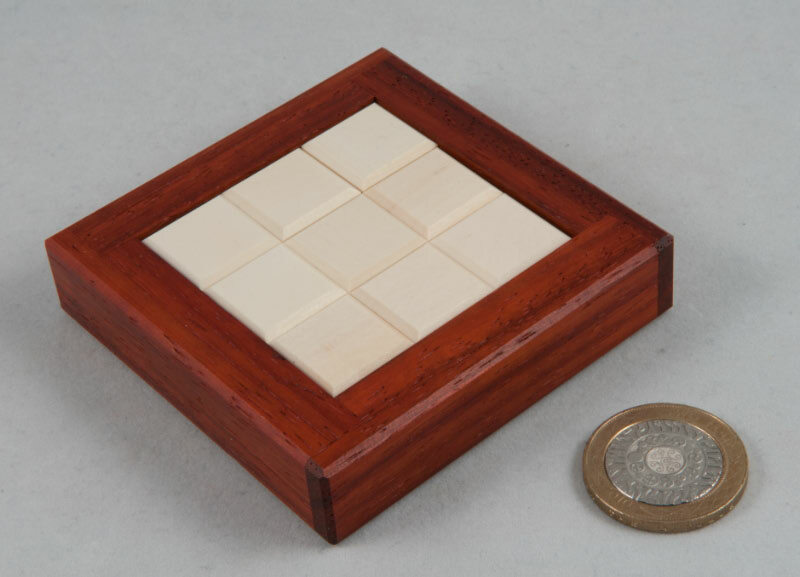 The tiles themselves have been mostly milled from a single piece of Holly each – the resulting fit between the pieces is terrific, with little or no play between them and no bowing at the centre of the grid at all when the pieces are in the frame. The result is a pleasingly positive feel where the pieces move smoothly when they’re properly aligned and don’t move when they aren’t. I did spend a while trying to construct a solution outside of the frame that allows for the obstructions inside the frame itself – and while that may be feasible, transferring that into the frame without losing my mind turned out to be somewhat harder … although in my defence, Burr Tools reckons there are a total of 2166 assemblies, of which only 4(!) are actually achievable inside the constraints of the frame - which somehow makes me feel slightly less of a failure as a puzzler! 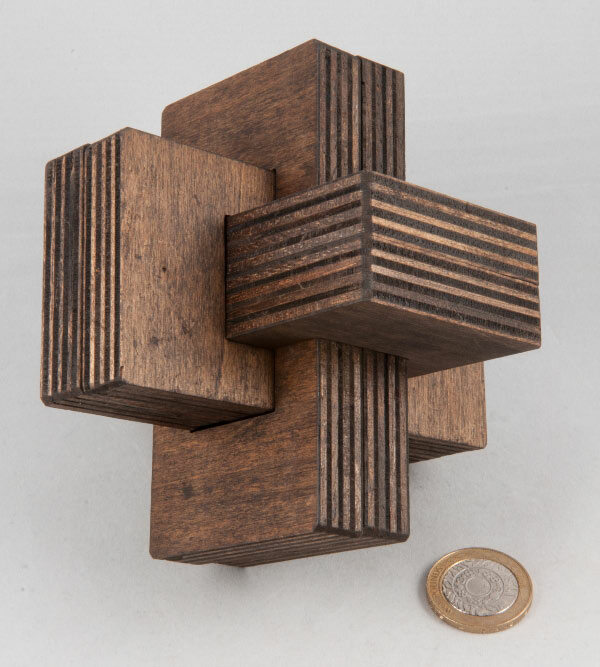 Sun, designed by Jos Bergmans, is a fiendishly simple-looking two-piece tanglement in wood (mine’s Maple) where the object is to join (tangle!) the two pieces so that the two halves of the sun (Sapele veneer on mine) are joined up. Eric (rather unsportingly!) 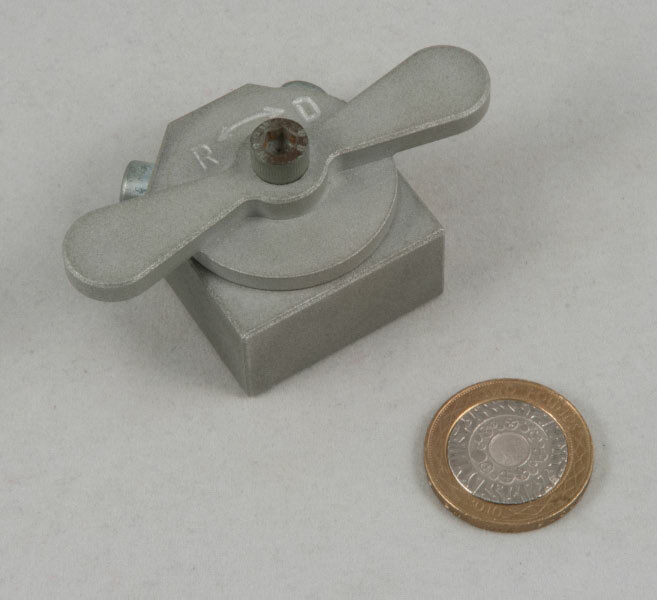 ships this one in two bits so you have no choice but to solve it yourself! Eric’s description of the pieces pointed out some of the finer points that non-craftsmen (like me!) 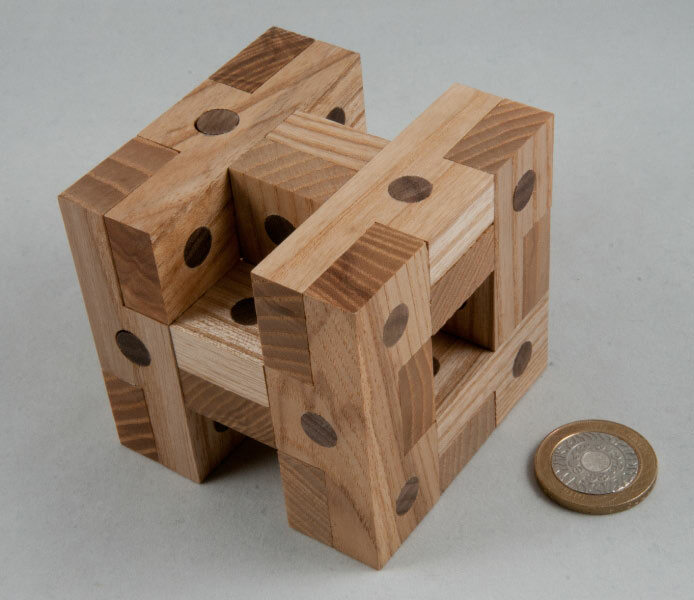 might not fully appreciate – firstly the edges are all square, which is unusual for this sort of puzzle, especially ones where rotations are (!) required and secondly, he’s paid special attention to the fully mitred joints – and looking at one of the triple-mitred joints shows just how accurate they are. 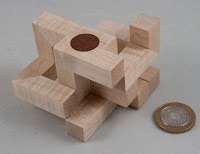 Fiddling with the pieces is quite fun and needs to be fairly precise – remember the bit about the square edges? 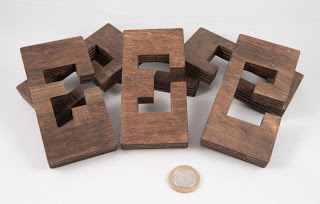 But that means that when something should work, it does and when it shouldn’t there isn’t much ambiguity, which can sometimes happen when the pieces have a little give in them (no chance of that here) or have rounded edges (you have been paying attention, haven’t you?). There are some surprising moves and I really enjoyed the way the final solution sort of snuck up on me and all of a sudden it was right there! 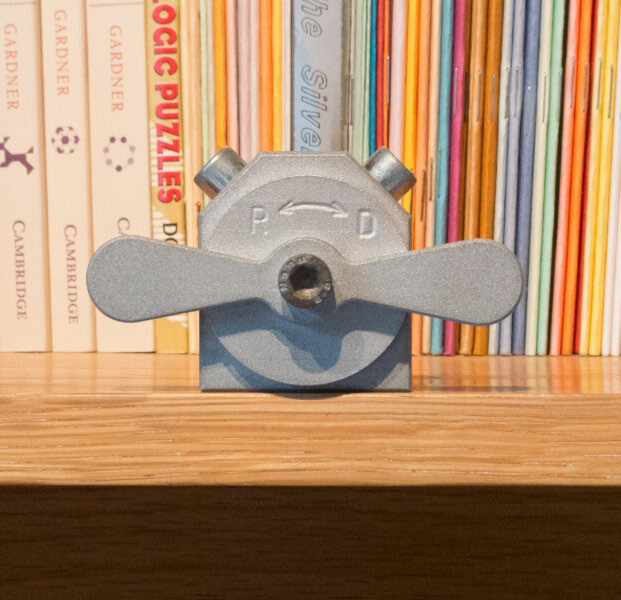 Even after taking it apart and putting it back together a bunch of times, I still find some of the movements interesting and unexpected – great little puzzle to fiddle with in an idle moment. 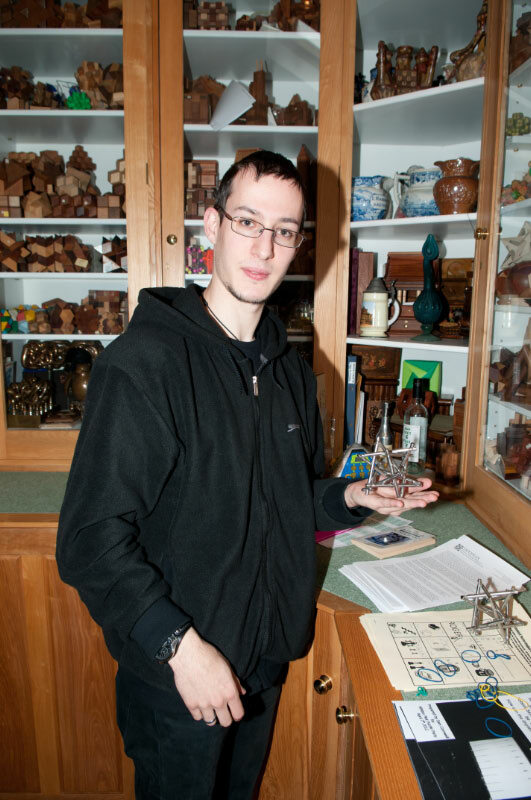 Alchemy is an Altekruse-ish puzzle designed by Brian Young, based on ideas in Stewart Coffin’s Puzzling World of Polyhedral Dissections. The book points out that variants on the Altekruse theme can be improved (read: made harder!) by adding pins and holes in them and Coffin gives some examples of them in his book … Brian Young then took that encouragement to extremes and came up with a design that uses 14 unique pieces(!). 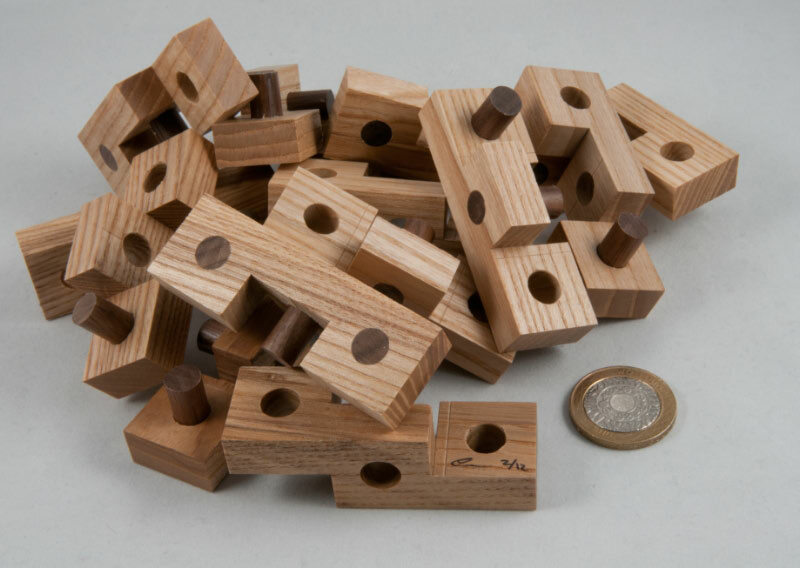 Eric’s version is made in Ash and has Walnut pins – as usual the tolerances are indecently good – things move smoothly when they should, and don’t move at all when they shouldn’t. When I described the puzzle as Altekruse-ish – that probably wasn’t particularly accurate – the basic structure is an Altekruse assembly – but the pins and holes make the positioning of the pieces and the order of assembly somewhat more critical than on a standard Altekruse – and before you ask, it’s way too hard for me to consider assembling without Mr Roever’s computational assistance!